1 Preheat the oven to 200°C (approximately 400°F). 2 For the cake: Separate the eggs and beat the yolks with half of the sugar until frothy. Beat the egg whites with a pinch of salt until stiff. Sprinkle in the remaining sugar. Continue beating until the mixture is shiny and peaks begin to form. Add the egg whites to the yolk mixture. Mix the flour with the cornstarch and gradually fold into the egg mixture. Evenly spread the batter on a baking sheet lined with parchment paper. Bake for 10-12 minutes. Remove the cake from the oven and turn out onto a tea towel sprinkled with sugar. Do not remove the parchment paper. Allow to cool. 3 Heat the jam slightly. Chop the chocolate coarsely and melt with the cream over a pan of hot (not boiling) water. 4 Rinse the strawberries and cut in half lengthwise or into quarters. 5 Cut the cake horizontally. Spread half of the jam onto the bottom layer and cover with the top layer. Gently press a cookie cutter into the cake to create circles (about 3.5 cm (approximately 1 1/4 inches)). Dip each piece of cake into the melted chocolate. Put on a cake rack to cool. 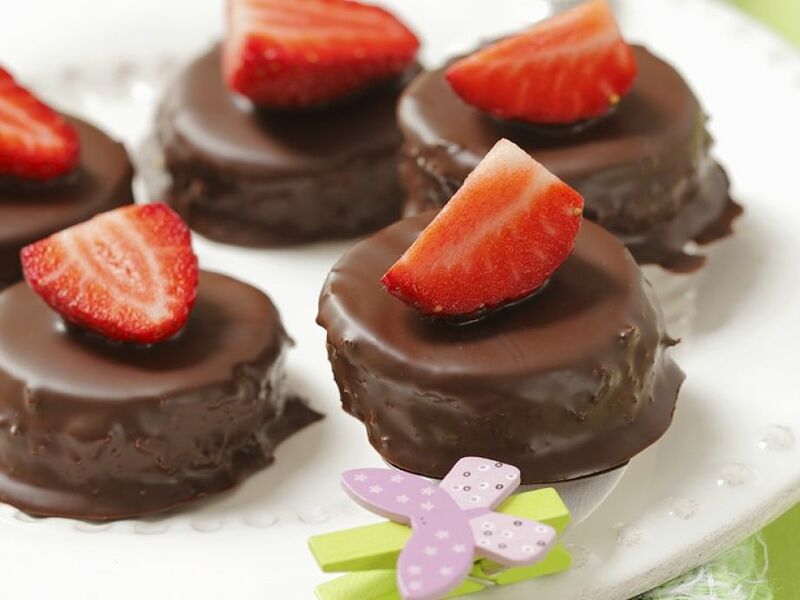 Garnish each cake with a piece of strawberry and let dry. Serve on plates.